the rumble of water – a morning at the waterfall park of Varone. It is raining. Although the lake is beautiful when it is raining, on a day like this it is an occasion to stroll around and visit the surrounding area. I asked the owner of the Hotel Riviera what could have been visited on such a day without going too far. They asked me if I knew about the Varone waterfall. The ideal place to visit, suggested Milena, wearing a rain proof jacket, on a rainy day as the water rumbles with a much stronger energy. Good idea I thought. So I took my car in the direction of Riva and just 3 km further along on the left are the waterfalls. The building of the ticket office is an interesting piece of architecture by Giancarlo Maroni (Arco 1893-Riva d/G 1952), also called the Architect of the Lake as he also constructed the Vittoriale of Gabriele D’Annunzio in Gardone Riviera. This building came, however, after the opening of the Waterfall which took place in 1874 when this area still belonged to the Austrian Empire. This attraction was meant for aristocratic tourists and crowned heads of state who visited the prestigious shore of Lake Garda such as Arco, Riva d/Garda and Gardone Riviera until the beginning of the first world war, as an area where one could recover from pulmonary diseases such as tuberculosis. It was the 20th of June and in the presence of King John of Saxony and Prince Nicholas of Montenegro that the waterfall was opened to the public. So I felt and could breath in a natural atmosphere the weight of history, how many important and popular figures came here before me: Franz Kafka, Gabriele D’Annunzio, Gustav Klimt and Franz Joseph, Emperor of Austria, Umberto II of Savoy, King of Italy, D. H. Lawrence…………… and I was impressed. The charm of it was that there was hardly anybody there, may be because of the weather, so there was no queue. I was soon surprised to see the amount of water crashing down from a high cleft. Where does this water come from? I started reading about it. The water from Lake Tenno seeps through and creates the river Magnone (or Varone) and falls down in this cleft from a 90 meter height with enormous strength and within a rocky funnel. This rare natural wonder can best be appreciated if one follows the path which leads higher and one can admire the water from two different points of view : a lower one and a higher one. 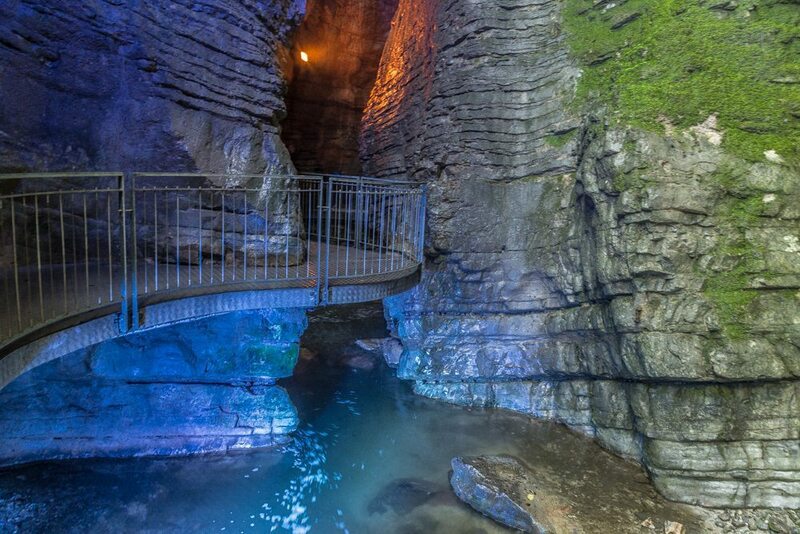 By walking in the lower cave one notices the erosion created by the water which has come crashing down for 20,000 years. One can walk from this level and go higher and see the erosion which has smoothed the rocks and which have developed round forms like long fishes. The sound of the water falling down is loud and noisy and the emotion of this energy is overwhelming. ​ The park itself is significant – by climbing the 115 steps along the botanical garden one can reach, through a 15 meter tunnel dug within the mountain, the higher cave from where one can see the huge pit and its depth. At this moment I am hugged by the nebula of the water. It is almost midday and some rays of sun enter the cave leaving a ray in the darkness which takes on different colours. 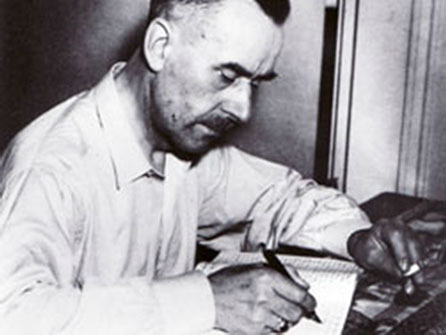 Thomas Mann among the writers who came here, described this place as horrific and fascinating and at the same time a site that inspired some beautiful pages of his masterpiece ‘The magic mountain’ (1924). A novel where the theme of illness and death dominates could not be inspired by the element of water alone and this description reminds us so much of the Varone Waterfall: ‘At the bottom of the deep, narrow abyss of bulging bare rock, slippery like huge bellies of fish, the flood of water crashed down with a deafening roar. Behind, above and all around could be heard threatening and warning calls, trumpets and the rough voices of men’. So ends my rainy morning. By the time I came out from the cave of the waterfall the sun was shining and from the nebula of the water the kaleidoscope of colours led me down towards the exit. At this point I could have gone higher and driven towards LakeTenno. But I did not want to loose so many positive energies coming from the waters that exploded from the depths of the mountains, I wanted to drive back to the Hotel Riviera with these overwhelming impressions. This short but deep journey between darkness, history and beauty and lie down at the edge of the Hotel Riviera’s pool, watching the rocks above me and smelling the strength of the air. My thoughts were refreshed and I needed more time to meditate on the strength of my encounter with the waterfall.